I have always loved chandeliers. To me, they bring up nostalgic images of European castle ballrooms filled with people in gorgeous outfits dancing the night away, extravagant theater lobbies, the Moscow subway, old churches with enormous (and sometimes very unusual) chandeliers hovering above the visitors, or here in the US, grandiose estates owned by the rich and famous. 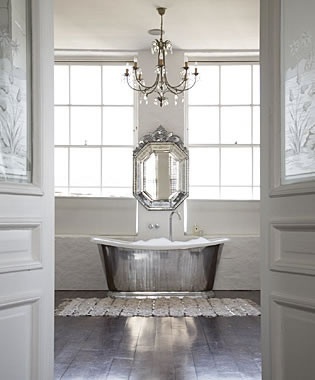 My grandmother had a huge, glittering crystal chandelier in her living room which always looked so glamorous and festive to me, and one of my long-time home decorating dreams is to have a big, luxurious bathroom with a chandelier in it. Like in the picture below – gorgeous, isn’t it? 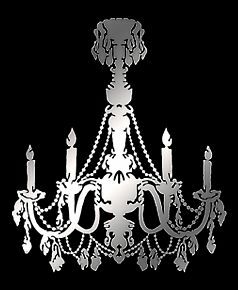 Glam and fabulous as they are, it does take a certain type of home (and ceiling height and room size) to handle those old-fashioned, large chandeliers. 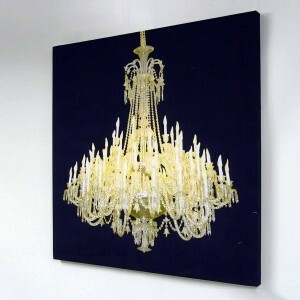 Luckily, nowadays, you can find them in any size, color and form (for some truly unique ones, check out the works by Dale Chihuly), but in tiny spaces, even a smallish chandelier can overwhelm the room. Don’t let that stop you though – if you can’t fit them on the ceiling, there is always room for them on the walls, and this way, they can take on some surprising (and fantastic) forms. 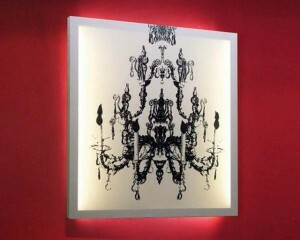 This quick-change artist is a wall mirror by day and chandelier by night. The rather unassuming-looking oak-framed mirror from Designers Anonymous turns into a subtle LED-lit chandelier when night falls. 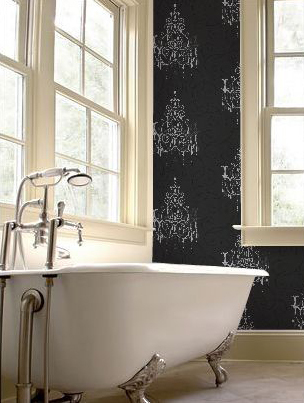 The chandelier wallpapers from Vymura London are anything but discreet. Bold, in your face colors, glittering inks and a textured background make these luxury wallpapers a focal point in any room. They come in hot pink, red, black, and white. 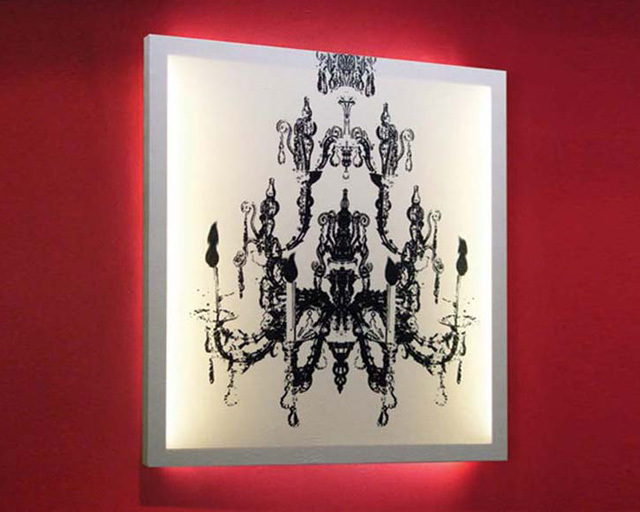 Wall sconces can take many forms, and Duffy London came up with this awesome take on chandelier lighting – wall since and chandelier all in one gorgeous piece. 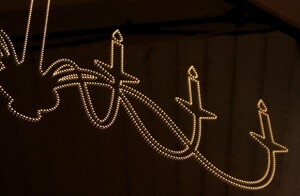 They come in several different colors and designs and are made out of eco-friendly materials and long-life fluorescent bulbs. 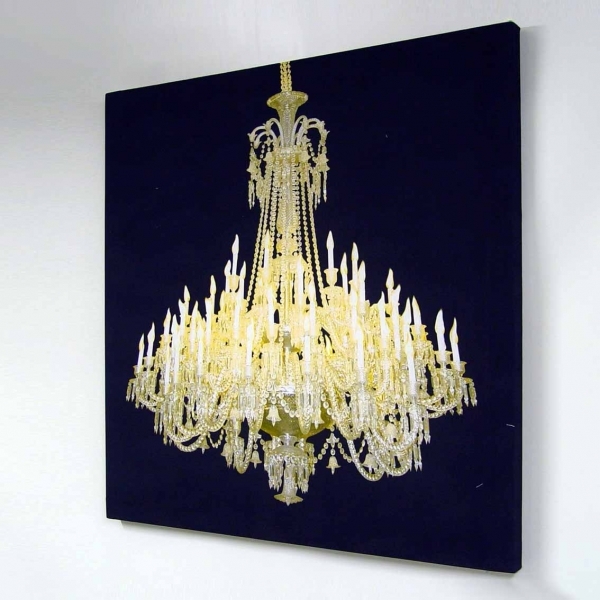 A different kind of chandelier mirror, this acrylic cutout from UK company Enlightened Art is so cute, and I think it would look adorable in a little girl’s room. Wall decals have become really popular over the past few years, and by now, you can find pretty much anything you can think up as a wall sticker. 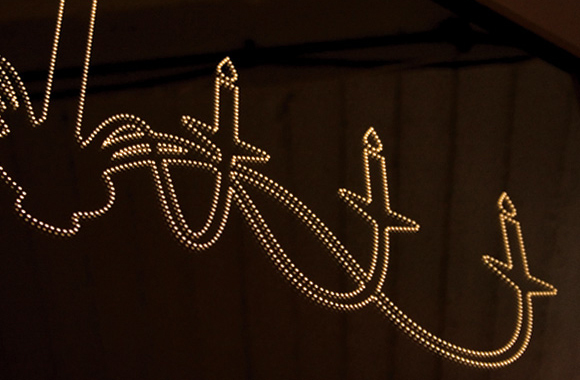 This adorable chandelier comes from Australian company Wallspace and measures 22.8×28″. 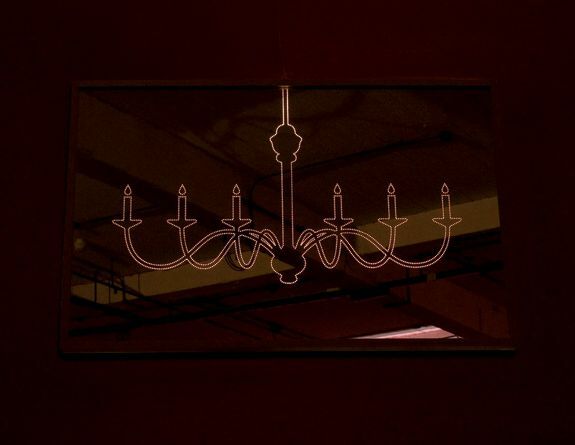 For those who feel like putting a little bit more time and effort into getting a chandelier on the wall (or a piece of furniture), there are stencils. 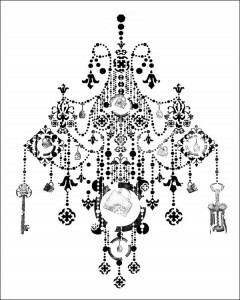 This awesome, creative stencil by award-winning British designer Kyu Seon Lee looks gorgeous on any surface and has a surprise when you look at it up close: it consists of household objects such as a wine opener, a key, teacups, etc. Love it! 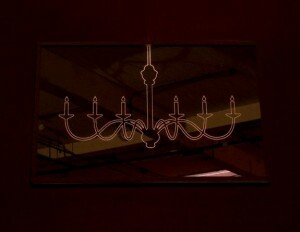 Regarding the photo of the chandelier wall art, specifically the metal chandelier pieces in the photograph, where could I find those to purchase? 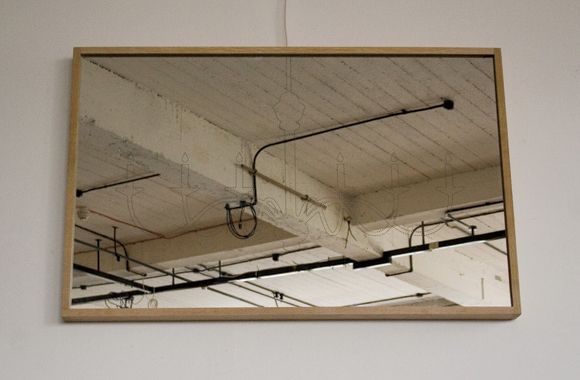 If you mean the mirror from Enlightened Art, unfortunately it seems they are out of business. 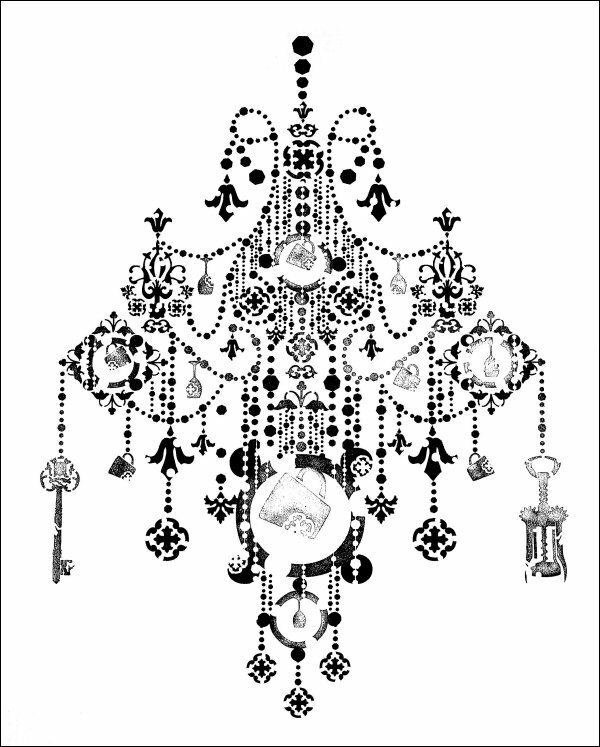 I would search for chandelier-shaped mirror and see what comes up.